Reports surfaced Saturday that President-elect Donald Trump had picked Exxon Mobil CEO Rex Tillerson to be his secretary of state, making perhaps his most controversial nomination yet due to the Texan's close ties to Russia. But before word got out about Tillerson, the Lone Star State had come up empty in Trump's cabinet appointments. Reports surfaced Saturday that President-elect Donald Trump had picked Exxon Mobil CEO Rex Tillerson to be his secretary of state, making perhaps his most controversial nomination yet due to the Texan's close ties to Russia. But before word got out about Tillerson, the Lone Star State had come up empty in Trump's Cabinet appointments. More than a month after Trump's shocking victory, he has not officially nominated a Texan for his White House, despite an initially long list of potential candidates. He has passed over at least three Texans, including U.S. Reps. Jeb Hensarling of Dallas and Michael McCaul of Austin, for jobs for which they were said to be under consideration. But there remains hope. In addition to Tillerson — whose selection the Trump transition team did not confirm Saturday — a number of other Texans are also seen as still in the mix. They include Agriculture Commissioner Sid Miller and former Gov. 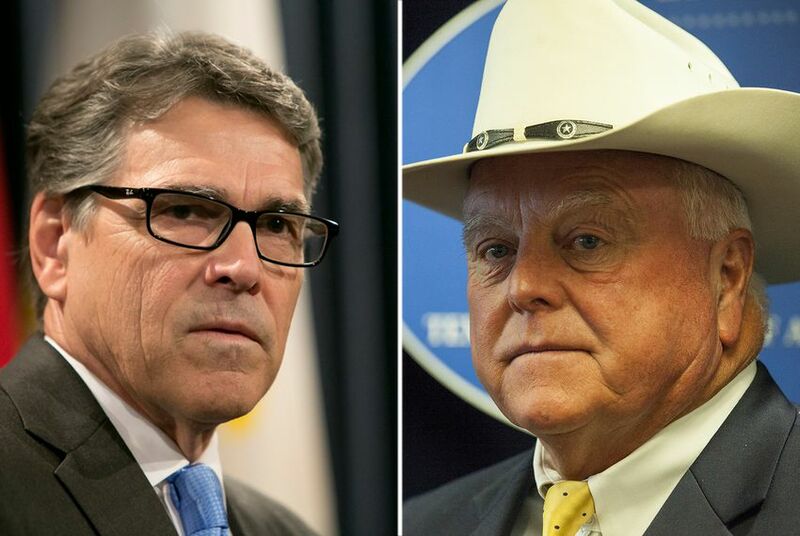 Rick Perry, as well as a few lesser-known names who could be up for lower-level positions. Perhaps the most notable snub came Wednesday, when reports surfaced that Trump had settled on retired Marine Gen. John Kelly to lead the Department of Homeland Security. McCaul was once seen as a leading candidate for the job, though immigration hawks had sought to upend his chances in the lead-up to Wednesday. As of Saturday, the transition team had not confirmed Kelly is Trump's pick. "If I can’t be the secretary of homeland, I’m very honored to have Gen. Kelly in that position," McCaul, who chairs the House Homeland Security Committee, said in a radio interview Thursday. "I know he's going to crack down on these sanctuary cities and basically say, 'We're going to cut federal funding if you don't comply with federal law,'" McCaul added, referring to cities that seek to protect their residents from deportation. Another Texan — Kathleen Hartnett White, who formerly chaired the Texas Commission on Environmental Quality — was thought to be under consideration to lead the Environmental Protection Agency, but that job went to Oklahoma Attorney General Scott Pruitt. Some in the Lone Star State still praised Trump's selection of Pruitt, who was a regular collaborator with Gov. Greg Abbott, the former Texas attorney general, on lawsuits against the EPA. "President-elect Trump’s selection of Scott Pruitt as Administrator of the EPA proves he is serious about creating jobs and rolling back the burdensome regulations implemented by the Obama administration," Abbott said in a statement. "I look forward to working with Scott as he brings common-sense policies to a federal agency that has been one of the biggest job-killers in the Obama administration." Hensarling did not make the cut either. He was seen as a candidate for treasury secretary, but Trump ultimately settled on Steven Mnuchin, his campaign's national finance chairman. Hensarling issued a statement after the Mnuchin announcement saying it was a "distinct honor to be considered." One less predictable Texan to show up on the transition radar was U.S. Sen. Ted Cruz, who feuded bitterly with Trump during the Republican primaries. One report last month said Trump was purportedly weighing Cruz for attorney general, though a few days later that job went to U.S. Sen. Jeff Sessions, R-Ala., one of Trump's earliest supporters in Congress. There is still speculation that Cruz could be Trump's pick to fill the vacant seat on the U.S. Supreme Court. Earlier this year, Cruz said he was not interested in a spot on the high court but has struck a different tone following Trump's election. "What I will say is that history is long and can take unexpected paths," Cruz told a recent gathering of conservative lawyers when asked if he would want to replace the late Justice Antonin Scalia. McCaul, White, Hensarling and Cruz had all made the trip to New York for meetings with Trump. Perry, who is talked about as a potential energy secretary, and Tillerson have also huddled with the president-elect at his namesake tower. Miller has yet to get an invitation, though he has said he does not expect Trump to begin considering his options for agriculture secretary until later this month. Ray Washburne, a Dallas investor who was one of Trump's top campaign fundraisers in Texas, has also been a part of the transition speculation. There have been mixed signals on what position Trump is might be eyeing him for, with the most recent report, published Wednesday by CBS News, saying he is the top candidate for energy secretary. Washburne, who is a member of Trump's inaugural committee, played coy during a sighting last week at Trump Tower. "Just hanging out," he told reporters when asked if he was there for a job interview, according to a pool report. "I thought the weather was nicer here than in Dallas." In recent days, reporters have spotted at least two other Texans coming and going at Trump Tower. There was Barry Switzer, former coach of the Dallas Cowboys, who joked that he was interviewing for the position of "secretary of offense." And then there was former U.S. Rep. Allen West, R-Fla., who now lives and works in the Dallas area. West, a member of the Texas Sunset Advisory Commission, told reporters as he left Trump Tower on Monday that he had met with Vice President-elect Mike Pence; retired Lt. Gen. Michael Flynn, Trump's pick for national security adviser; and K.T. McFarland, Trump's selection for deputy national security adviser. Other people with Texas roots have been spotted at Trump Tower, but neither they nor the transition team have clarified what they were doing there. They include Irving Mayor Beth Van Duyne, a vocal opponent of illegal immigration like Trump, and Alberto Gonzales, the former U.S. attorney general who was among the few to defend Trump in his spat with a federal judge during the campaign.